This experience will start at the end of the day until around midnight, be prepared for the best evening of your trip. Starting from Ponta Delgada at 18h00 . Pick up at any place situated inside the city of Ponta Delgada. Don't worry about the weather, worse is better, imagine you in warm water to the neck and feeling the cold drops of rain in your head or you can have a beautiful night full of stars, come to see what you gonna get. The village of Furnas is very similar to other beautiful villages in Azores - white buildings, decorated churches, and cozy little streets. However, what it's famous for are the hot springs. this will be one the highest moment of our experience. 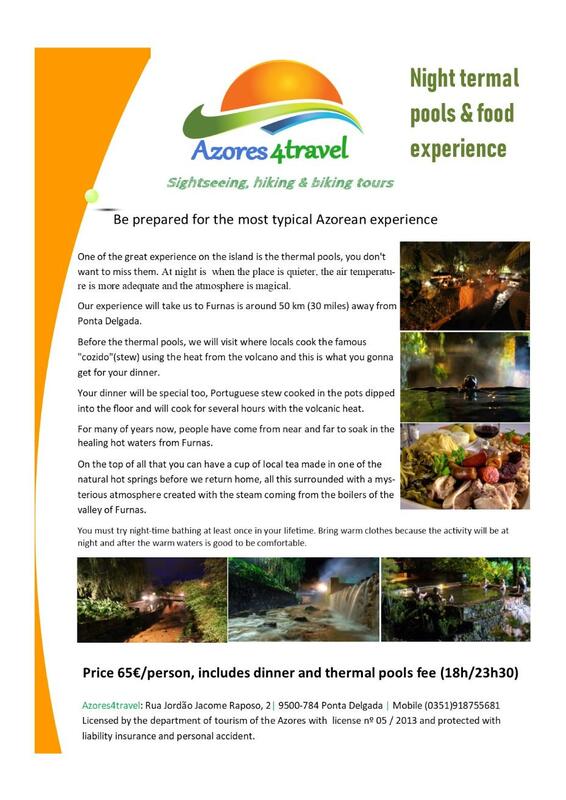 Apart from all this, you can also admire Caldeiras das Furnas: multiple boiling waters and mud springs as well as mini-geysers. They are strewn all over the town. You can also drink the mineral water.